The new chief of the Nepal Defence Army says his group is ready to carry out more attacks against Catholic churches and place of worship. The parish priest at Kathmandu's Assumption Cathedral and a Protestant leader receive threats. 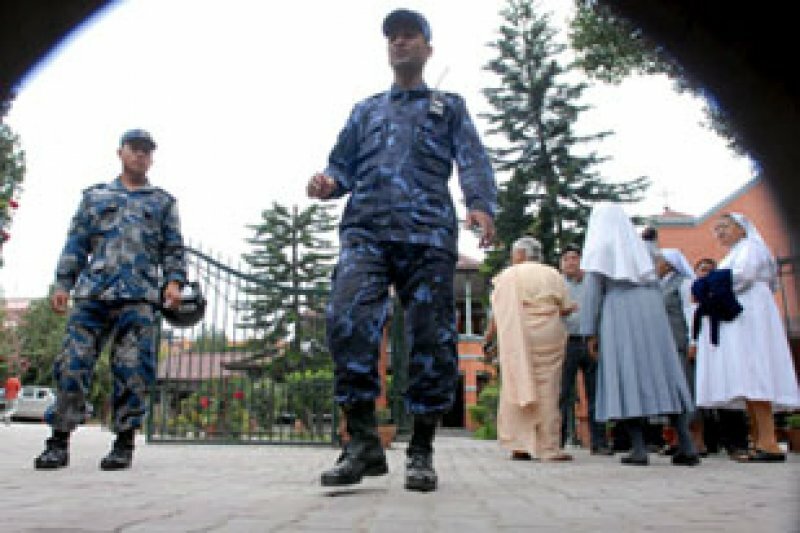 Kathmandu (AsiaNews) - Hindu extremists from the Nepal Defence Army (NDA) have issued telephone threats against Catholic churches, and circulated leaflets ordering Christians and Muslims to leave the country. Chirendra Satyal, a Nepali Catholic media official, and Fr Robin Rai, parish priest at Kathmandu's Assumption Cathedral who was targeted by the same group in a 2009 attack, received threatening phone calls. "On 7 August, someone called claiming to be the NDA's new chief," Satyal said. "He thought he was talking to a priest, and hung up when I told him I was not." The next day, the same individual contacted Fr Rai, claiming to be Sangharsha, the new NDA leader. "In the call, which lasted a few seconds, the Hindu extremist said that he would plant a bomb at our church if we did not help his group," the priest explained. "But when I asked what type of help he wanted he hung up." Sundar Thapa, a member of the Federation of National Christians-Nepal (FNCN), also received threats. He said that Sangharsha told him to dissolve the federation and leave the country. According to the terrorist leader, Nepal is a Hindu nation and Christians and Muslims are not welcome. Rising tensions among religious minorities have forced them to take measures to protect their places of worship by deploying security guards to avoid attacks. "Police have started an investigation into such criminal activities," the Lalitpur Police Superintendent Basanta Panta said yesterday. He added that he would remain in contact with leaders of the Christian community, and that police would provide protection to places of worship and other sensitive areas. After months of silence and attempts at reconciliation, the NDA has recently gone back to armed struggle to create a Hindu state, taking advantage of the country's instability. Since 2007, Nepal has been without a constitution. On 7 August, police foiled a series of attacks against public buildings by seven members of the terrorist group. Former NDA leader Ram Prasad Mainali was behind them even though he has been in jail since 2009. To prevent him from communicating with the outside world, prison authorities recently placed him in solitary confinement. In 2010, Mainali wrote a letter to Nepal's Catholics asking for forgiveness for his role in the attack against Kathmandu's Assumption Cathedral. However, his contrition proved to be a ruse to avoid further investigations into his group. In addition to the cathedral attack in 2009, the NDA claimed responsibility for attacks against the Union Mission to Nepal, a Protestant organisation, as well as the United Nations headquarters in Kathmandu and a number of mosques. The group has also been accused of murdering Fr John Prakash, head of the Salesian school in Sirsya (Morang), in July 2007.